Inquisitive and observant, Dora dreams of escaping her aristocratic country life to solve mysteries alongside Sherlock Holmes. So when she learns that the legendary detective might be her biological father, Dora jumps on the opportunity to travel to London and enlist his help in solving the mystery of her cousin’s ransomed love letters. But Dora arrives in London to devastating news: Sherlock Holmes is dead. Her dreams dashed, Dora is left to rely on her wits–and the assistance of an attractive yet enigmatic young detective–to save her cousin’s reputation and help rescue a kidnapped heiress along the way. Steeped in Victorian atmosphere and intrigue, this gripping novel heralds the arrival of a fresh new voice in young adult literature. Thank you Around the World ARC Tours for the book! 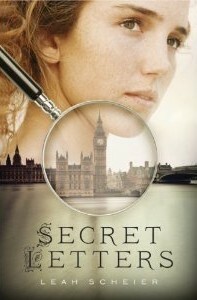 I was very interested in reading this book because I love mysteries and Sherlock Holmes. Recently, I haven’t read a lot of historical fiction so this was a bit new for me. Secret Letters follow the story of Dora, a girl living in the country, dreaming of becoming a detective. When she learns that Sherlock Holmes is her biological father, she can’t wait to go to London and meet him. However, her plans don’t turn out quite like she hopes they would. Instead of Sherlock Holmes, Dora meets Peter, a young detective who takes it on himself to help Dora and her cousin with their little blackmailing problem. I liked Dora as a character. I enjoyed watching her try to prove herself in the male dominated world. She took risks and she used her head, and I always love that in a heroine. Peter, however, was probably my favorite aspect of the story. He was fun and dominated the story even though he wasn’t the main character. I just loved him. A lot. I wish there was more of him in the story, and I wish there was more of him and Dora in the story. Overall, this was a good read for anyone interested in Sherlock Holmes-esque stories. The ending left an opening for another book, so I’m looking forward to other adventures by Dora and Peter. This debut comes out June 26th.